Interstate 15 runs along the west side of Beaver between the ends of Business Loop I-15 & SR 160. Far to the north from the overpass at Exit 109 are the distant Gillies Hill and Fourmile Range. Photo taken 08/17/13. The Beaver Business Loop for Interstate 15 follows Utah 160 along Main Street for 3.808 miles. The bulk of the route follows old U.S. 91 between Exits 109 and 112.
Business Loop I-15 & SR 160 curve east from I-15 to overtake the former alignment of U.S. 91 along South Main Street. Photo taken 07/15/17. The first shield for Business Loop I-15 north in Beaver stands by the intersection with South Creek Road. Photo taken 07/15/17. Crossing sloughs associated with the Beaver River, Business Loop I-15 & SR 160 advance north along Main Street to the Beaver street grid. Photo taken 07/15/17. Entering the Beaver city center, Business Loop I-15 & SR 160 (Main Street) meet the east end of SR 21 (Center Street). SR 21 navigates west between the Black and Mineral Mountain ranges to the town of Minersville. Photo taken 07/15/17. Traveling 107.58 miles overall, SR 21 ventures northwest across the Escalante Desert to Milford. The state route transitions to Nevada 487 near Garrison and east of Great Basin National Park. Photo taken 07/15/17. Two blocks north of SR 21, Main Street intersects the east end of SR 153 (200 North). Photo taken 07/15/17. SR 153 parallels the Beaver River east from Beaver into Fishlake National Forest. 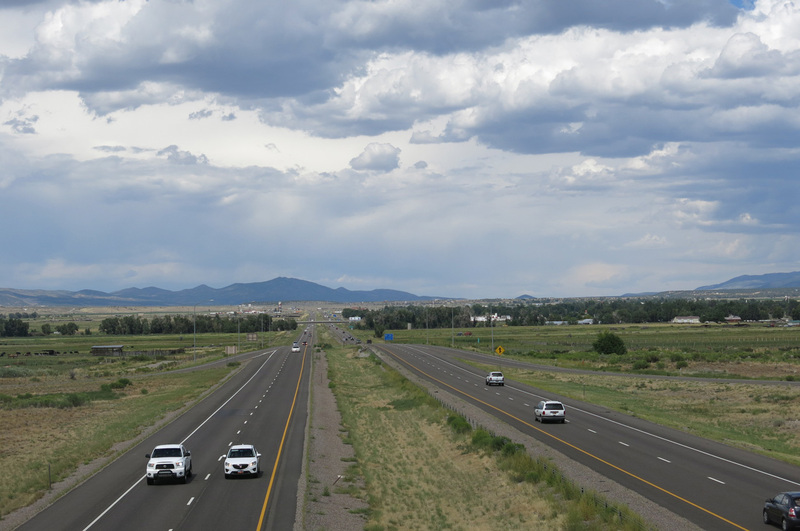 The 40.49 mile highway tops out over 10,000 feet in elevation on the drive east to U.S. 89 at Junction. Photo taken 07/15/17. Heading out of the Beaver street grid, Business Loop I-15 & SR 160 (Main Street) split with historic U.S. 91 at Manderfield Road. Photo taken 07/15/17. The business route curves west from 1175 North for the return to Interstate 15. Photo taken 07/15/17. An array of traveler services lie both west and east of the diamond interchange at the north end of Business Loop I-15 & SR 160. Photos taken 07/15/17, 08/17/13. 1400 North extends beyond the southbound on-ramp to Cedar City by a truck stop and a pair of lodging establishments to rural areas outside Beaver. Photo taken 08/17/13. An end shield for SR 160 stands at the northbound on-ramp for I-15 to Cove Fort and Salt Lake City. Photo taken 07/15/17. Second photo taken 08/17/13. 1385 North crosses the Beaver city line just ahead of the diamond interchange joining Interstate 15 with Business Loop I-15 & SR 160 south on Main Street. Photo taken 08/17/13. As dusk sets in with Black Ridge and Black Mountain looming in the distance, Business Loop I-15 & Utah 160 lead away from I-15 and curve southward onto old U.S. 91 (Main Street). Photo taken 10/18/04. The initial shield assembly for Business Loop I-15 & SR 160 south in Beaver had changed somewhat by 2010. The west end of SR 21 lies 1.5 miles ahead. There is no direct connection otherwise between Interstate 15 and SR 21. Photos taken 08/17/13. Manderfield Road (historic U.S. 91) parallels I-15 to the east from the community of Manderfield across Last Chance Bench. The former US highway merges with Business Loop I-15 (Main Street) just south of 1175 North in Beaver. Photo taken 08/17/13. Reassurance marker for Business Loop I-15 posted at Main Street and 870 North. Photo taken 08/17/13. Vintage sign for Anshel's Cafe along Main Street south between 870 and 600 North. Photo taken 08/17/13. SR 153 stems east from Business Loop I-15 & SR 160 (Main Street) along 200 North from Downtown Beaver. SR 153 is the Beaver Canyon Scenic Byway, a 17 mile scenic route leading into the Tushar Mountain Range to SR 21 and Eagle Point Ski Resort. Photo taken 08/17/13. SR 153 travels 40.49 miles from Beaver across Fishlake National Forest to U.S. 89 at Junction near Piute Reservoir. Photo taken 08/17/13. Two blocks south of SR 153 is the east end of SR 21 (Center Street). Photo taken 08/17/13. SR 21 ventures 107.58 miles west from Beaver to Minersville, Milford, Garrison and the Nevada state line. SR 487 extends the highway northwest to Baker and U.S. 6/50. Photo taken 08/17/13. SR 21 travels five blocks west to pass under I-15 to agricultural areas outside the city limits. Photo taken 08/17/13. Business Loop I-15 (Main Street) shifts southwest to 200 West. I-15 is another 1.25 miles ahead. Photo taken 08/17/13. Crossing the Beaver River along Main Street south of 200 West. Photo taken 08/17/13. South Creek Road heads southeast into Kane Canyon from Beaver to areas within Fishlake National Forest. Photo taken 08/17/13. Business Loop I-15 separates from the historic alignment of U.S. 91 as it curves west back to Interstate 15. Photo taken 08/17/13. An end shield for SR 160 stands at the diamond interchange (Exit 109) with Interstate 15. Photo taken 08/17/13. Interstate 15 follows a linear route north along the west side of Beaver back to the north end of Main Street. The west end of I-70 lies 23 miles away. Photos taken 08/17/13. Interstate 15 travels 46 miles south from the end of SR 160 to the north end of the Cedar City business loop. Photo taken 08/17/13.